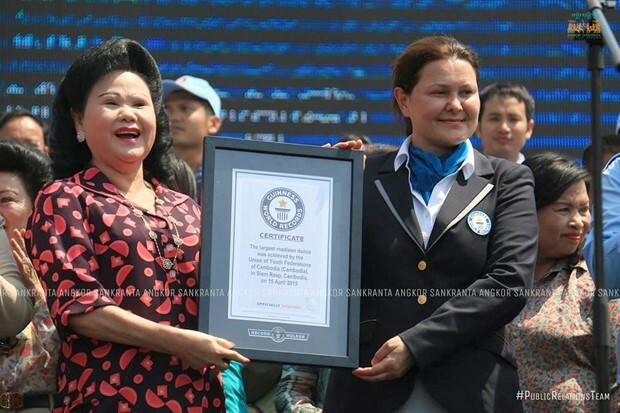 Cambodia broke the Guinness World Record for the largest Madison dance with 2,015 participants, announced this afternoon in the cultural province of Siem Reap by visiting Ms. Seyda Subasi Gemici, who represented Guinness World Records. 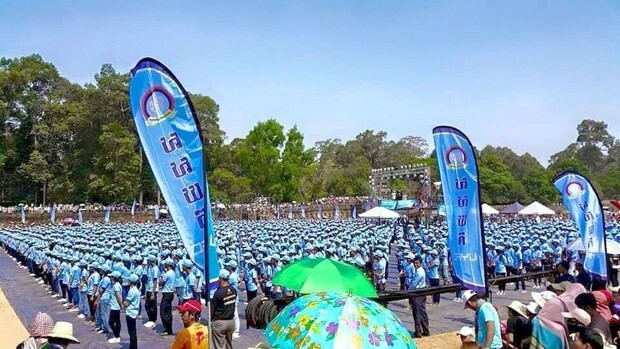 This largest ever Madison dance was organized by the Union of Youth Federations of Cambodia (UYFC) on the occasion of Angkor Sankranta 2015 to celebrate the Khmer Traditional New Year from April 14 to 16. The last record of the largest Madison dance was performed by 1,155 participants in Australia in 2014. On April 13, 2015, the giant Nom Ansorm, Cambodian sticky rice cake, cooked especially for the 2015 Angkor Sankranta celebration, also won a Guinness World Record. The giant Nom Ansorm of 4.04 tons has been cooked for 45 hours by 100 chefs and sous chefs. The cake has been packed by 333 kg of banana leaves and 375 kg of banana strings, and the ingredients included 1,000 kg of sticky rice, 499 kg of coconut milk, 15 kg of salt, 499 kg of mung beans, 507 kg of bacon, 4 kg of sugar, 7 kg of Kampot pepper, 10 kg of minced garlic, and 16 kg of minced garlic leaves.